Is the E7 Stool different from the Motion Stool? We're glad you asked! Our designers made the E7 so that it offers you the same generous range of adjustability, but with a handle on the back so it's portable! This makes the ergonomic stool ideal for last-minute meetings and impromptu brainstorming sessions. Enjoy perching with the E7, or if you're looking for a different type of seat, check out our chair comparison chart for an easy breakdown of all of the features. What is a "sit-stand" chair? A sit-stand seating option allows you more flexibility when you work at an adjustable height desk. Our E7 Stool works best with a height-adjustable desk where you need to change from sitting to standing without rearranging your workspace or readjusting your seat a lot. To adjust to a higher or lower height, just grasp the lever under the seat and apply pressure to lower it, or stand up slightly to raise it. 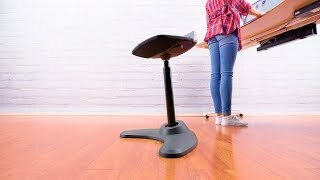 Can this stool work at both standing and sitting positions at my sit-stand desk? The E7 Stool offers a generous 11.25" height adjustment range. At the stool's lowest setting of 21" most users will be able to comfortably sit on the stool. For standing, you can perch on the stool by leaning back on the seat. Will this still work if I'm petite? Yes it will, but you may not be able to sit fully on the stool at its lowest height setting. We advise that users under 5'2" tall pair the E7 Stool with a footrest for a little extra height. If I'm 6'2" can I use this stool? You can! The E7 Stool goes up to a generous 32.25" tall to support our taller users. Is sitting on this anything like sitting on a balance ball? The E7 Stool is designed to keep your body engaged similar to that of a balance ball, but with this stool you get the added benefit of a supportive stool that won't pop or roll away when you stand up. The stool also engages your core muscles while you perch at your desk, but it is not meant to be used as exercise equipment. You should always keep your feet firmly planted while you use the stool. Can I use the E7 Stool as my all-day chair? The E7 Stool is designed to complement a sit-stand workstation, but it should not completely replace your ergonomic office chair. This is because it does not lower as far as office chairs, and does not offer back or lumbar support that most people need when sitting for multiple hours a day. Yep! The E7 Stool comes with a built-in handle on the back of the seat so you can move it from room to room! Is this chair okay for kids? No, because the stool only lowers to 21", it cannot go low enough to safely support children or anyone under five feet tall. Our E7 Stool offers a soft seating experience thanks to the padded seat with breathable fabric. We think you'll agree, it's one of the most complete and comfy sit-stand stools out there today! Will this stool tip over while in use? No, the weighted base will keep your stool upright while you are sitting on it, and even while you are not seated! However, don't lean too far to the side or back, because this can throw off the chair's weight and cause it to tip over. Here are some safety tips for sitting: Try not to sit down too quickly on the stool, and use your hand to make sure the seat of the stool is positioned under you when you go to sit down or perch. Yes! You can adjust the height of the E7 Stool easily with simple height adjustment releases underneath the seat. To raise, take your weight off the stool, squeeze the release, and adjust upwards! And put your weight back on the stool and squeeze the release to lower the stool.